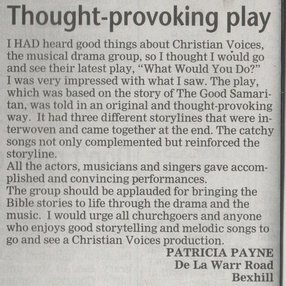 A kind letter from Patricia Payne of Bexhill in 2009 with respect to our performances of What Would You Do? printed in the Bexhill Observer. Posted by harlekwinblog on 14/02/2012 in Comments, Press and tagged Comments, Press.